The United Way movement began in 1887 in Denver when four clergymen conceived the idea of a united annual fundraising campaign to help large numbers of people with financial needs. The campaign was successful and the idea of raising money “the United Way” spread nationally and globally. Today, United Way continues to bring the community together to tackle issues that are larger and more complex than the capacity of any individual or single agency to solve alone. At the time of United Way’s founding, communities needed an efficient way to raise funds for worthy charities. United Way provided the solution. Through the years, dollars have remained critical. But today it is understood that financial investments alone are not enough to create lasting change. Communities benefit from United Way’s ability to view the entire landscape of human need and address the total picture of what it takes for a person to succeed. Communities also need leadership that transcends the public, private and non-profit sectors. United Way of the Greater Capital Region fills that role. Local United Ways are independent and separately incorporated. In the Capital Region, United Way’s work is guided by local volunteers from all walks of life who have a vested interest in the area’s future. United Way’s vision is a community where all individuals and families achieve their potential. Thanks to donors, corporate partners and funded agencies, United Way today is helping more people rise above their challenges for a better tomorrow. 1887 Denver, Colorado: a priest, two ministers and a rabbi coordinate a single campaign for ten health and human service agencies, raising $21,700 in this first united effort. 1924, the United Way came to Schenectady County to meet the community service needs of the burgeoning Electric City and its environs. Led by Rev. G.H. Baker, United Way raised an amazing $159,033. 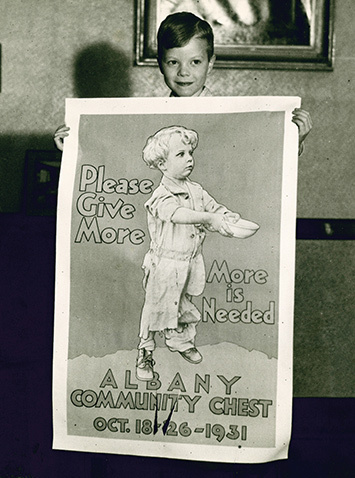 1925 The Albany Community Chest is officially incorporated. 1938 The Troy Community Chest holds its first federated campaign. 1957 The Community Chest of Saratoga, Inc. is created. 1978 United Fund of the Albany Area, Inc. and United Way of Saratoga County, Inc. combine into an area-wide organization known as United Way of Northeastern New York, Inc.
1987 United Way of America celebrates its 100th birthday calling for a bold effort to double its volunteer involvement and dollars raised. 1988 United Way of Mohawk-Hudson Area, Inc. and United Way of Northeastern New York, Inc. formally consolidate. 2015 United Way of the Greater Capital Region celebrates 90 years of changing lives and making our commuity a better place to live and work.